KIEV, Ukraine – Under the slogan “Impeach Poroshenko”, another march of supporters of Mikhail Saakashvili was held, the “Political Navigator” correspondent reports. Several thousand people from different regions walked from Shevchenko Park along Khreshchatyk and Institutskaya Street to the square in front of the Verkhovna Rada. The demonstrators carried a huge banner with the inscription “For Impeachment”, posters with the inscriptions “People’s Impeachment!”, “Hang the Crooks!”, “For yourself, you made an offshore, and for us – Holodomor, in the budget – surplus, and people – genocide! “,” Impeachment to the President! “, etc. The crowd chanted “Mafia – go!”, “Glory to our Nation – death to the enemies!” On the streets of the institute, militants joined the march, they shouted “Avakov, the dog, we’ll hang him on a tree!”. 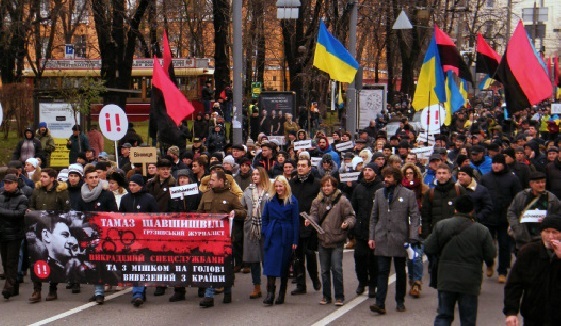 Although the deputy head of the Verkhovna Rada of Ukraine, Irina Gerashchenko, was indignant at the fact that Saakashvili’s supporters used the song “Plive Kacha” during her marches (they buried the victims in Euromaydana), and this time they started up with it when the march turned onto Institutskaya Street. At the memorial of the Heavenly Hundred, marchers stopped for a moment of silence. At the intersection with Bankova, in front of the police cordon, blocking the passage to the Presidential Administration, the protesters symbolically “threw Poroshenko’s promises of history into the rubbish heap”, i.e. threw posters on the asphalt with his portraits and the text of unfulfilled promises, and then trampled on them. Some of the demonstrators, with special pleasure, wiped their feet on the face of Poroshenko.